Pro-union protesters have filled the streets of Barcelona in defence of Spain’s “institutional normality”. After the demonstration, Spanish Prime Minister Mariano Rajoy has tweeted calling for “seny”, a Catalan expression for ‘common sense’. “Catalans will speak with freedom,” he adds. Under the slogan “we are all Spain” and waving Spanish flags, the rally underlines the depth of division in Catalonia itself. “I’m here to defend Spanish unity and the law,“ said Alfonso Machado, 55, a salesman standing with a little girl with Spanish flags in her hair. Signs and chants against deposed Catalan leader Carles Puigdemont have also been reported. What do we want? That they don’t break us up. This is a disgrace. We are not going to consent. They are shameless, shameless, and Mr Puigdemont needs to be taken to prison,” said protester Maria Lopez. 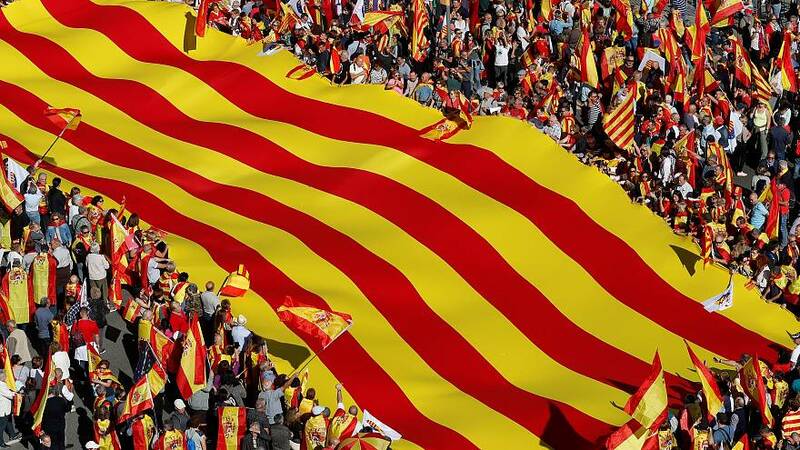 Catalan municipal police force, Guardia Urbana, have said more than 300 000 people attended the rally. Organisers have reported a turnout of over a million people. The march comes a day after the Spanish government’s push for control over Catalonia. Yesterday, in compliance with Article 155, Spanish Deputy Prime Minister Soraya Saenz de Santamaria was put officially in charge of Catalonia in a blunt response to the region’s unilateral declaration of independence on Friday. In a pre-recorded broadcast message, Carles Puigdemenont has called for a “democratic opposition” to the direct rule imposed in Catalonia. Madrid has said Puidgemeont should take his message to the polls. “He has no powers and no financial means so I insist that if he wants to continue in politics, which is his right, I think he should prepare for the next elections to be held on December 21, and there he can exercise this democratic opposition,” said Spanish government spokesman Inigo Mendez de Vigo.